Saturday 4th June will see the 4th ‘Operation Market Larden’ event in Evesham. Having missed last year, I was very keen to attend this event, and offered to put on a game. Plan A was to refight the ‘Pont de la Croix’ scenario from ‘Operation Warboard’, especially as this was the first ever World War II scenario I ever played. However, since the scenario pits American against Germans, this has been put on the back-burner until I paint my US forces. It seemed sensible at this point to fight a battle with the forces we have got: British Paras and German Heer/Panzer Grenadiers. Plan B was to fight the ‘V for Victory’ scenario from Red Devils in the Night. This is a ‘what if’ scenario which pits British Paras up against a large force of German Panzer Grenadiers and supporting armour. I was originally very keen on this, but the more I looked at the scenario, the more I felt that it wasn’t quite what we were after. 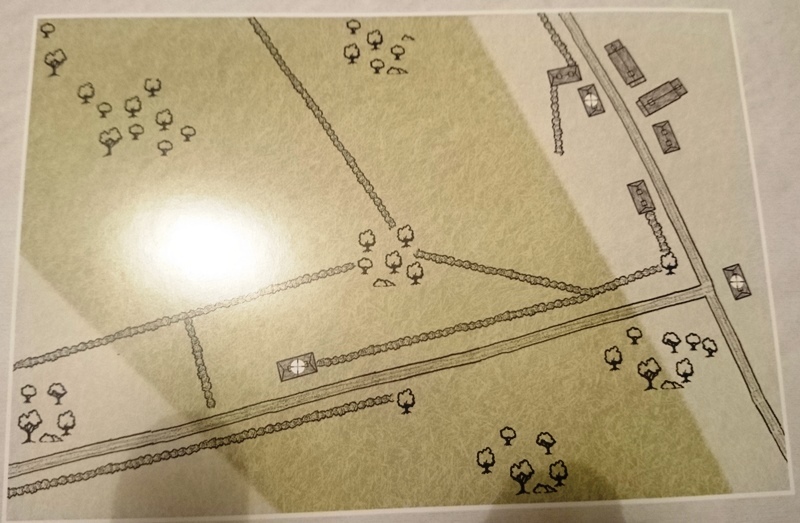 Whilst looking through the Battlegroup Overlord book, I found the ‘First Battle Honours’ scenario, which covers the Battle of Breville on the 12th June 1944. A blog post about fighting this scenario using IABSM by the Devon Wargames Group can be found here. Looking at the forces involved, each side had two infantry platoons, along with armour and artillery support. I was pretty convinced that this was the scenario I wanted to now use, and decided that I needed to buy some more figures. Hence my addition Germans arriving on the painting table. The Scenario Map. The British will have to capture the three marked buildings. In the end we decided to halve the infantry forces and support involved, but keep the same armour support. This means that each side has an infantry platoon, an armoured troop, plus some other support options. It should make for an interesting game of Big Chain of Command. This gives 26 Force Points in total. The British Commander choses what teams are in the Engineers section. This gives 10 Force Points in total, leaving the German forces with a further 16 points to spend on other support options. Minefield (1) – maximum 2, Barbed Wire (1) – maximum 4, Road Block (2) – maximum 1, Entrenchments – infantry team(1), AFV (2) – maximum 4, Strengthened Building (3), Ambush Marker (2) – maximum 2. This should give the German player a choice of a bit more firepower, plus a lot of static defences for the British to deal with. The Ambush Markers are equivalent to having a Chain of Command Dice that can only be used for the ‘Ambush’ action. A couple of notes about the historical battle. The attack was carried out following an artillery barrage, hence the support option for the British Airborne. The actual battle actually took place at night. However, we’ve decided to forgo any night-fighting rules for simplicity, as we’ve found them a bit problematic when playing them over the last few scenarios. The upshot is that I didn’t need to buy/paint those German Infantry after all (although I suppose they will always come in useful), but I do need to finish the Marder III and then paint some large entrenchments and some Czech Hedgehogs. Meanwhile, Dave will have to paint a couple of Shermans and a Firefly. All being well we will be playing a test game next week.